'Oro Rayo' is a south facing villa that is situated on the valley side of the Montgo mountain range and close to the natural park. 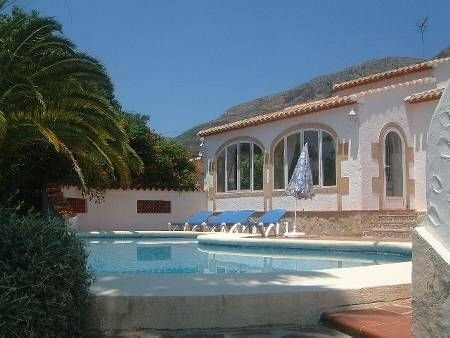 It is just off the Jesus Pobre Road and is 2 miles from the quaint village of Jesus Probre and 4 miles from Javea. A car is essential for getting around. The La Sella golf course and Marriott Hotel is 5 minutes drive away. There is a supermarket 200 meters away and 4 restaurants within a 5 minute drive on the road towards Javea. The villa is on a 1/2 acre plot and it's size provides seclusion and quietness. There are many fruit and palm trees and the ground is covered mainly by gravel. English Freeview channels available An air-conditioning allowance of 150 units per week, if this is exceeded a charge of 12 cents per unit is applied. Views of the valley and the Montgo Mountain Range.